Natural habitat: Victoria and South Australia. Found in the winter months throughout Outback and northern Australia. Mostly docile, but can turn vicious when provoked. The Grey Nomad spends summer in the southern states of Australia, mostly out of harm’s way, watching the races, knitting socks for the grandchildren and betting on the pokies. But come the cold winter months they take flight and head en masse for the warmth of northern Australia. Flight is hardly the word, though, for this particular bird. With a girth equaling the Titanic, a voice like that doomed ship’s foghorn and an accent that makes Julia Gillard sound like she’s taken elocution lessons, the Grey Nomad can be quite an off-putting sight. Usually travelling in flocks, the Grey Nomad likes company. So much so, they will pull up directly beside your tent in an otherwise empty campground and proceed to set up camp. This usually takes several hours and involves the careful placement of a washing line, a shower, and a satellite dish. Yes, Grey Nomads have cable. They also have more money than you. So while you wash the dishes by torchlight, you can listen to the Grey Nomad watching the Olympics. The other advantage of the Grey Nomad’s love of proximity is the chance to learn more than you ever wanted to know about which health insurer has the best cover on hip replacements, which colostomy bag works best in a caravan, and the merits of corned beef over spam for dinner. 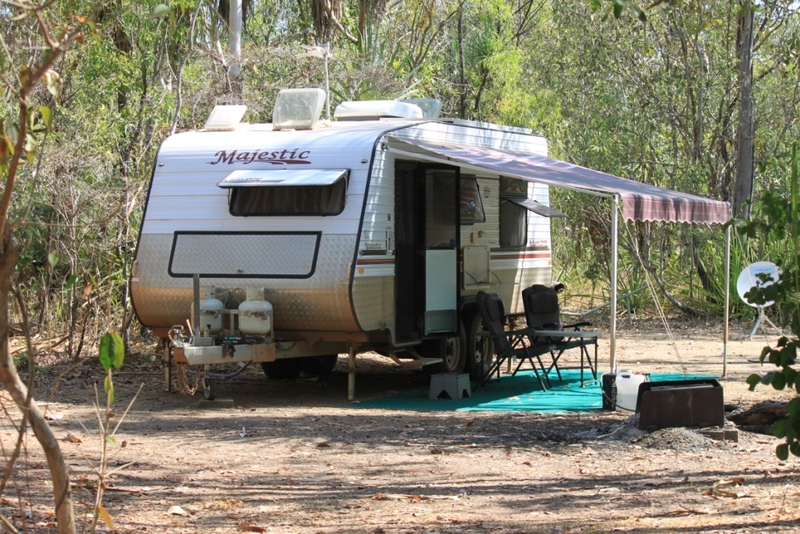 The Grey Nomad might be nomadic, as the name suggests, but they also love to stay awhile. They have nothing better to do, and after all, they’re spending your inheritance. So when you pull up at a particularly tricky river crossing, you can be sure there will be a bunch of Grey Nomads sitting on the other side, deck chairs out, drinks poured, ready to see whether or not you make it across. Yes, alas, the Grey Nomad does come in a 4WD variant. This sub-species exists thanks to off-road camper trailers, which allow this otherwise bitumen-dwelling creature the chance to truly spread their wings to the dirty roads of Outback Australia. Which means that just like the blowfly, they are pretty much everywhere. Even when you are parked up for the evening in the most isolated spot imaginable, it’s usually only a matter of time before Ron, Esther, Harold and Mabel round the bend, ready for a good game of scrabble. And as you drift off to sleep at night, the last thing you’ll hear is a debate over whether tonight is a wooly singlet night – conjuring an image sure to stalk your dreams all night long. The Grey Nomad, like most birds, awakes early, with a clattering of pots and pans. Then it’s off the next destination – and it’s the same way you’re going. A grey nomad in the wild. Note the satellite dish on the right.